With Valentine’s Day coming up, a heart-shaped diamond is the ultimate symbol of romance. Although heart diamonds are trendy today, with many women choosing them instead of traditional cuts, they’ve been around for a long time before that. Diamond hearts have left a trail of class and beauty throughout history. They started out as a symbol of royalty. The first time diamond hearts appeared was in conversation between the Duke of Milan, Galeazzo Maria Sforza, and Nicodemo in 1463. The Duke described mythical quests of the wealthy Cosimo de Medici of the political dynasty in Florence as being similar to a heart-shaped diamond. The seed was sown. Shortly afterwards, in 1562, Mary Queen of Scots sent Queen Elizabeth a beautiful ring with a heart-shaped diamond in it. This is one of the most famous diamond hearts in history and during this period it was thought to be a symbol of friendship as well as goodwill. 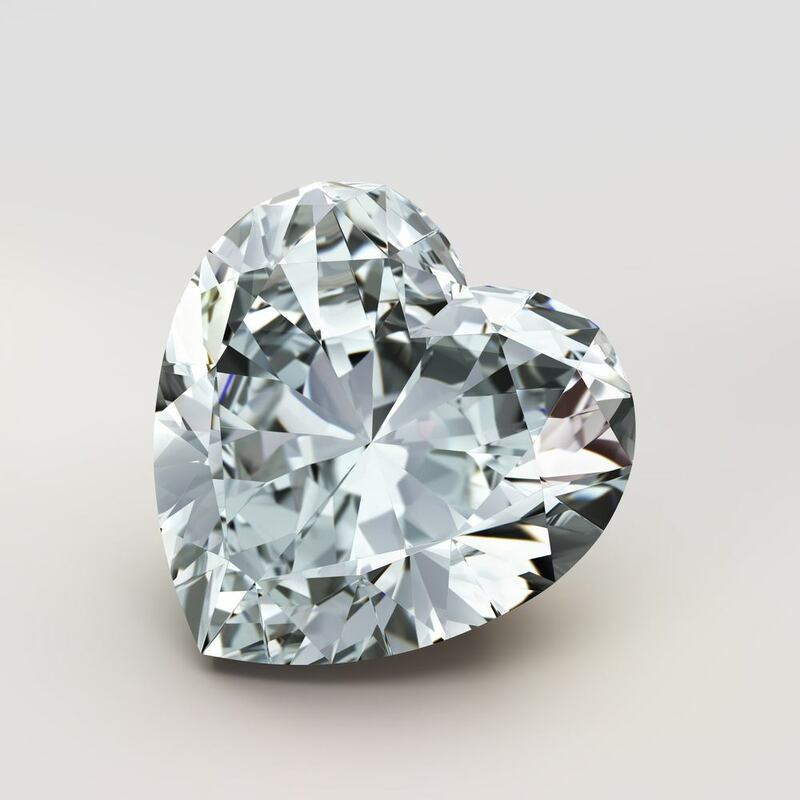 Around the same time, nobleman Cardinal de Richelieu owned a 20 carat diamond heart thought to have been given to him by a wealthy diamond merchant. The stunning diamond was said to be willed to the king. Although heart-shaped diamonds have become more popular and accessible, they still remain the most expensive diamond cut. This is because of how unique they are, along with the labour as well as tools they require to be made into a symmetrical heart shape. Whether you’re purchasing a diamond heart for yourself or a loved one, you should always take a closer look at its symmetry. You want the halves of the heart diamond to be identical in shape and size. The sides of the diamond (known as its wings) should be slightly rounded, while its cleft (the point in the middle between the two rounded halves) needs to be distinct. If you are choosing a heart-shaped diamond that is much smaller, bear in mind that anything less than .50 carats is not advisable. This is because the diamond heart shape will be much more difficult to notice in a smaller diamond, so it will not be as effective. When buying a smaller heart-shaped diamond, you should look for one that is that held in place with prongs that will maintain and accentuate its shape when it is set into the piece of jewelry. Bear in mind that the type of jewelry in which the heart-shaped diamond will be set also influences how narrow or wide the heart shape will be. For instance, if the heart-shaped diamond is going to be used in a solitaire diamond ring, you will want a wider cut to give it the most flattering shape. Elizabeth Taylor, the epitome of elegance, received a stunning heart-shaped diamond known as the Taj Mahal for her fortieth birthday in 1972, courtesy of Richard Burton. The diamond was flat and big, decorated with rubies in a gold necklace. While the heart diamond shape has never been the most popular among the masses, in the past few years there has been an increase in celebrity engagement rings with vintage and non-traditional shapes, including the heart. One of the most well-known heart diamond engagement rings belongs to Lady Gaga. Her boyfriend, Taylor Kinney, gave her a glamorous ring featuring a large, wide diamond with perfect symmetry. Another celebrity to flaunt the heart diamond is Nicki Minaj. What makes her engagement ring such a stand-out is it’s rich yellow color and double-halo setting, so heart lovers take note: the setting of a heart shaped diamond ring can elevate it from cheesy token to a symbol of love and luxury. Hearts are the classic emblem of love, and with the right style, heart diamonds are a wonderful jewelry gift idea to mark any romantic occasion.